Marquage au dos : HENRY. The Football Market. c'est quoi ?. Raison sociale : THE FOOTBALL MARKET SASU. FC Nantesvoir. Equipe de FranceVoir. Date immatriculations RCS : 2018. SIRET : 840 635 395 00014. Player HENRY. Shirt Number 14. Item Type Shirt Only. EAN Does not apply. Country Spain. MA GL IA M AT CH W OR N SH IR T. SP ED IZ IO NE V IA C OR RI ER E ES PR ES SO A SS IC UR AT O. C AR TE LL IN I DI O RI GI NA LI TÀ. MA GL IA M AD E IN T HI LA ND IA. AS SE NZ A SF EI TT W DR Y FI T SU LL A MA GL IA I N BA SS O A SI NI ST RA. HENRY 14 SUL RETRO NELLA TRAMA. Da collezione! IMPOSSIBILE LASCIARSELO SFUGGIRE!! RISPARMIA ACQUISTANDO PIù OGGETTI! COSA ASPETTI! OCCHIO ALLE FOTO! Possibilità di invio foto ulteriori tramite WhatsApp, possibilità di ritiro manuale dell'oggetto in zona Torino. 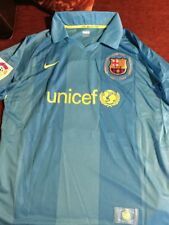 BARCELONA FOOTBALL SHIRT #14 HENRY ,100%POLYESTER, GOOD CONDITION. Label size -- L. Real size -- L.
EQUIPO/TEAM: Barcelona. SPANIEN: 5 ?. INTERNATIONAL: 15?. INTERNACIONAL: 15?. ENVIO ESTANDAR. ESPAÑA: 5 ?. GASTOS DE ENVÍO Y MANIPULACION INTERNATIONAL: 15 ?.